The $250,000 Spring Classic returns to Stones Gambling Hall in Citrus Heights, with five tournaments beginning April 13 and numerous satellites, all culminating in the $150,000 guaranteed Main Event April 19 to 22. Buy-in to the Main Event, which has three Day 1s (April 19 to 21) is $450 and six satellites to this event are scheduled with buy-ins of $60 and $110. The $200 Win The Button tournament on April 13 has a $15,000 guarantee, and the next day’s Chip Amplifier event ($120 to $550 buy-in) boasts a $45,000 guarantee. This is followed by the $25,000 guarantee Assassin’s Bounty, with a buy-in of $300 and $100 bounties. The April 16 Classic Mix Max has a $15,000 guarantee and $200 buy-in, and after that comes several days of satellites to the Main Event. The final tables will all be shown on Stones Live (available on Twitch TV and You Tube) with special guest commentators Jason Somerville, Lex Veldhuis, Andrew Neeme, and Kevin Martin covering the play-by-play action. “Why I’m really excited about the Spring Classic is the pros that will be doing commentary,” said Stones Gambling Hall ambassador (and voice of the World Series of Poker) Lon McEachern. 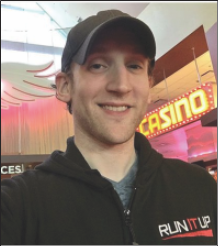 “Even though it’s not going to be an official Jason Somerville and company Run It Up event, Jason is going to dovetail his Run It Up Reno PR and people stuff with the Spring Classic here at Stones. Another big event coming up at Stones is the return of the Quantum $100,000 guaranteed tournament from April 30 to May 6. Just as they did in November, the Stones Quantum event will start with seven Day 1s, each with a buy-in of $120. Players will receive 10,000 chips and 10 percent of the field will advance to Day 2 on Sunday, May 6. On May 4 and 5 there will be two more Day 1s, only the buy-in will now be $240 with players starting with 20,000 chips and 20 percent advancing to Day 2. The third buy-in option is to directly enter into Day 2 for $900 and begin with 100,000 chips. Players who make it through the allotted percentage on their Day 1s will not only advance but will also receive $250 at the end of the session. Anyone who double qualifies will play their larger stack on Day 2 and will receive $900. Multiple qualifiers will get an additional $900 for each additional chip stack that is removed from play.